LEBANON – An evening vesper service was recently held at Armco Park by the lake. 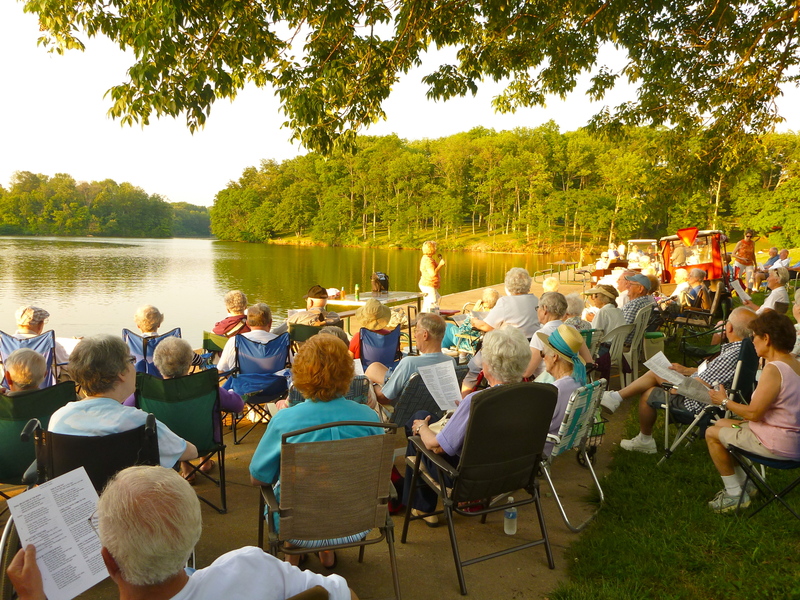 Seventy residents from Otterbein and a few Otterbein friends gathered to enjoy an evening sunset and a time of fellowship, worship, and nature as they celebrated the first day of summer and the partnership between Otterbein Lebanon and Armco Park. 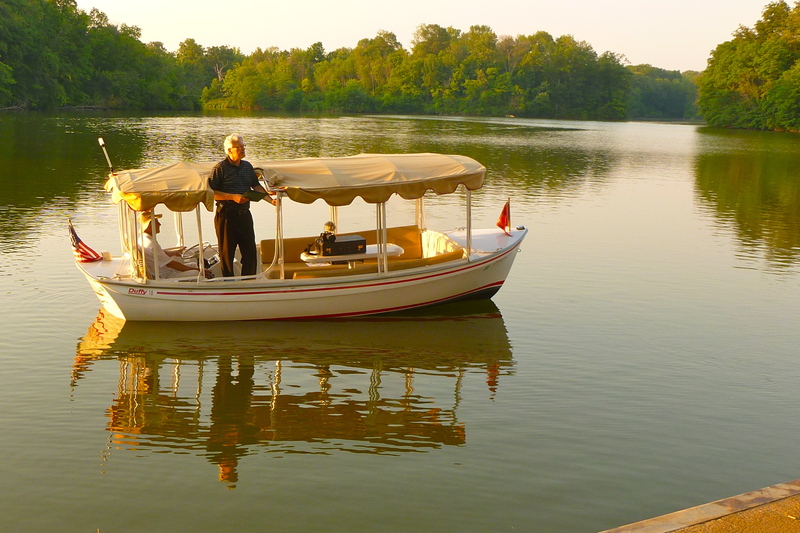 Duffy boat rides were offered from 4:30 to 7:30 p.m., prior to the vesper service. Several couples and friends enjoyed a picnic dinner at the park prior to the vesper service. During a visioning session by the Otterbein Lebanon United Methodist Church Christian Task Force Committee in February 2012, members discussed ways they could enhance and promote the spiritual and holistic growth of older adults. Last year, Otterbein Lebanon was blessed with the donation of a Duffy boat, as well as access to the beautiful Armco Park. “We discussed several opportunities that were available to the residents at Otterbein Lebanon, but also began asking how can we enhance and promote spiritual growth with opportunities that are already present. As we talked about the use of the new Duffy boat, we began to entertain the thought – let’s use the Duffy boat to bring people together in worship and celebration as well as promote our partnership with ARMCO Park,” said Otterbein UMC Chaplain Barb Schnecker. Schnecker said their goal was to share the opportunities that were available with the residents at Otterbein, as well as invite the residents to celebrate the beginning of the summer season and even take a ride on the Duffy boat and enjoy the natural habitat. The Duffy boat was used as the focal point of the service, with Rev. Jim Ludwick reading scripture and then providing a meditation, and Capt. Jerry Ferguson at the helm. Music was enjoyed as Ginny Longmire played the electric keyboard, George Koehler played the violin, and Jim Ludwick played the trumpet. Songs were led by Rev. Barbara Schnecker. The Otterbein Lebanon UMC mission committee provided refreshments. Those who attended responded positively with great enthusiasm and expressed appreciation for such a wonderful celebration and event. It is the hope of the Otterbein Lebanon UMC pastors/chaplains to plan more such events with Armco Park in the future. This is a great way to experience how Otterbein residents and their family and friends can come together to celebrate and worship in meaningful ways while enjoying Otterbein’s partnership with the Warren County Park District at Armco Park.